On December 1st 2011 the NASA Kepler planet finding mission celebrated its 1000th day in space and with over 1000 planetary candidates and 27 confirmed planets observed I would say that it was 1000 days’ worth celebrating. On March 6th 2009 Kepler was launched as NASA’s 10th Discovery mission. The mission was designed to survey our region of the galaxy to determine what fraction of stars have terrestrial-size planets in or near the habitable zone and for the last 1000 days it has been doing just that and more. Kepler is a 0.95 meter telescope with a high precision photometer (light counter) which is able to continuously observe over 100,000 stars. 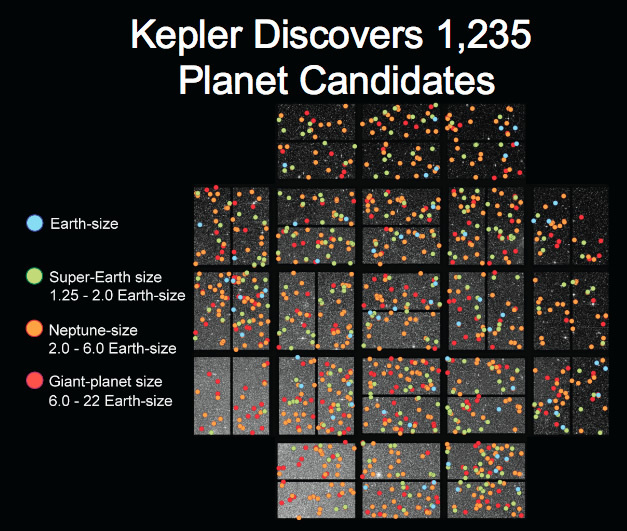 Out of these stars the Kepler has discovered, 2165 eclipsing binaries, and 27 confirmed planets. 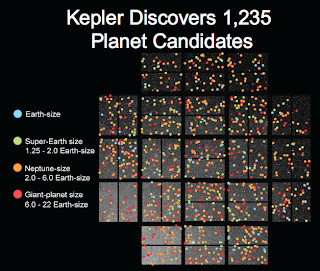 Recently Kepler also released a list of 1235 planetary candidates so called as follow up observations need to be made to verify that they are in fact planets and not a result of other astrophysical phenomena. The illustration from the Kepler NASA website shows the expected size of these planetary candidates and their position in the field of view of the telescopes detectors. The aim of the mission is to put our solar system into context something which requires observations of the vast number of stars. Kepler provides a great opportunity for detailed photometric observations and although it is only looking at a very tiny portion of the sky the results thus far gives us great hope for finding an Earth like planet in the future. outside our own solar system. This week the first Kepler science conference is being held and a great number of new discoveriesrs are sure to be anounced as a result. Kepler anounced a further 1094 bringing the total up to 2326 associated with 1792 stars in just 16 months! I will leave you with this quote from a very wise man.